Money Manager Ex is a free application that lets you keep track of your income and expenses in a simple manner. The program has a clean UI that’s perfect even for beginners. You can fill in related details for each sum of money you spend and receive as well as create monthly budgets. For the latter option you’ll have to specify the estimated income and all expenses – under various categories like „Bills”, „Automobile”, „Education”, „Healthcare”, „Taxes”, „Leisure” and so on. Furthermore, you are able to create databases – a base currency is needed in this case. The application currently supports Dollar, Euro, Pound, Swiss Franc, Zloty and Ruble and you can create three types of accounts – Checkings/Savings, Investments and Term. 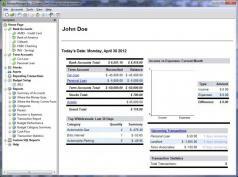 The application can generate several kinds of reports like income vs. Expenses, cash flow, account summaries and others.